On Dec. 9, 1934 in the second annual NFL championship game, the Giants played the Chicago Bears at the Polo Grounds in New York. A freezing rain the night before the game froze the field. 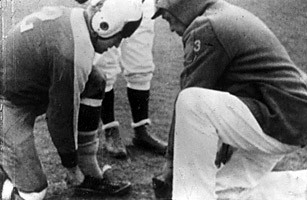 The Giants' coach, Steve Owen, saw his team struggling to gain traction wearing cleats on the frozen ground and and sent an assistant to Manhattan College to get some basketball sneakers. The Giants were ahead 13-3 when the switched to basketball shoes, which allowed the players to gain a better purchase on the tundra. When the Giants won 30-13, players from both sides of the "Sneakers Game" admitted the Giants dominated the second half because of the sneakers. Sometimes, you have to admit, it is all about the shoes. See TIME's Top 10 NYC-Boston Showdowns.